Now streamline your audio and video file recordings with WM Converter. WM Converter 2.0 is a multi-format audio and video converter. The WM Converter has a developer interface which makes the program a little complex to work with. Select an audio or video input file and then choose the format you want to convert. Recording footage in Real Time or from a URL and selecting the automatic recording mode are few of the basic utilities of this software. Convert all of your YouTube downloads to multiple video formats and extract MP3 audios from your selected URLs. WM is an extremely user friendly converter (once you are familiar with the interface) that can be chosen for most popular media format conversions. There are enormous options to convert your FLV recordings into iPhone, iPod , Zune, DVD formats. You can also convert MPEG2 camera movies to smaller MP4 files or WMV files, convert audio CD's into MP3 and so on. WM converter supports several formats, among which MP3, MPEG, MOV, FLV, WMV and ASF are the popular ones. Choose the DirectShow method for a better quality conversion. But it is only for special quality effects when you are not satisfied with the output quality. When you need to upgrade the converted file quality, or if any conversion fails for some reason in terms of quality then use this method. This feature is available only in the registered version. WM Converter has this unique feature of video speed control to generate slow or fast motion effects. It can be done by selecting a video frame rate at a lower or higher level than it was in the original. It is also very useful for a perfect synchronization of the visuals with its audio output. But be rest assured that this change of setting will not change the audio track speed. 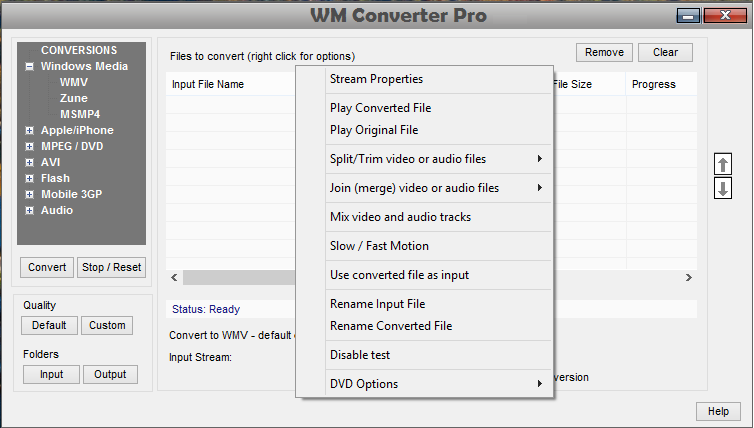 WM converter allows you to re-convert, reprocess or split the output file of any previous conversion. WMV/Zune can be used by Windows Media Player. MP4/iPod by QuickTime, MPEG-2 files to smaller MP4 that can be played in your Apple iPod, or else you can also convert high quality MPEG-2 files to high quality MP4 files. WM Converter supports MPG, MPEG-2, MPEG-1, 3GP, MP3 and WAV files with Media Player. It plays AVI files with Windows Media Player or Real Player and the FLV files with the FLV Player included right inside the WM Converter installation package. There is a separate option to convert your media files into DVD folders or to open your DVD files using WM converter..
WM Converter can convert, split and merge multiple files to and from all popular audio and video formats. You can also remove audio files from your video if you want to. You can even change the audio levels in the video! WM Converter can convert multiple video and audio files of the same format in one go. The list of files is neatly stacked in a sheet making it easy to watch and control the processing as it goes on. 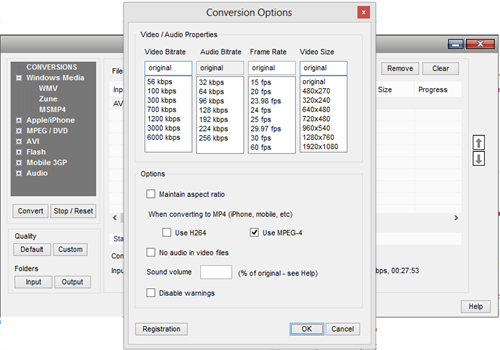 WM Converter can merge multiple files regardless of their video size, format, bit rate, etc. In WM, merged files are converted into an ASF file with a .mrg.asf extension. WM Converter is a very simple program and is easy-going for the newbies once they are familiar with the buttons. It does not make any changes to your computer settings. According to many users, it has proved itself to be comparatively faster than other converters. WM program doesn't use much of the system resources and also provides with a reliable online help file. WM Converter definitely needs some navigational and other interface improvements. It needs a better layout for a quicker identification of options and buttons. Right now it looks like it has been left at the pre-final development level where it is easy for the developer to use its features but can be a little challenging for a common user to actually understand from where to import files, how to select the output type and where to select the output folder. Overall WM Converter is a recommendable program, especially the 2.0 version has got all the standard features which any video converter should include. WM Converter is free of cost that comes with the WM Recorder 12 Bonus Bundle that consists of many more features and functionalities. Read more about WM Video Converter.